Sunday May 17th 1896 I was busy about the work all forenoon. After an early dinner I read and wrote till four oclock when it looked so much like storm that we went to do the chores. I got supper and read in the evening. 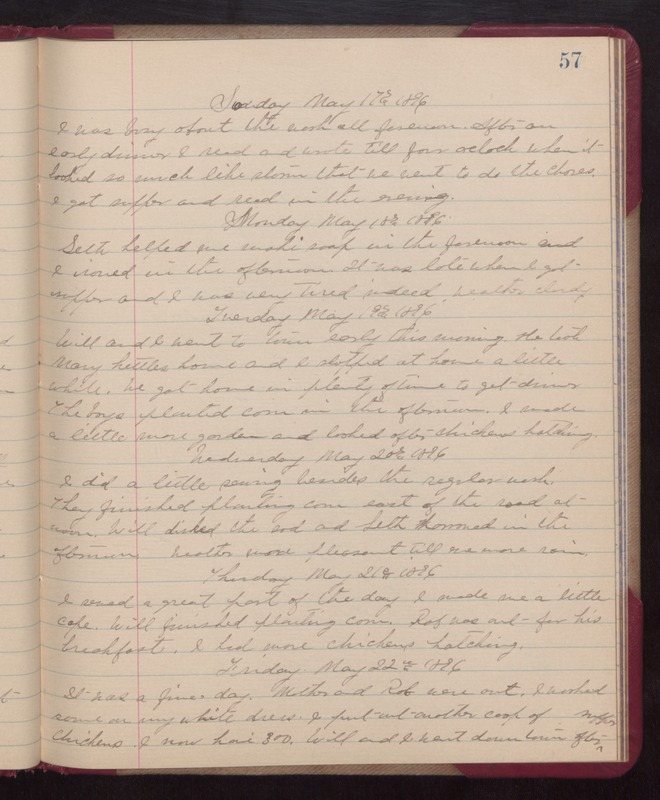 Monday May 18th 1896 Seth helped me make soap in the forenoon and I ironed in the afternoon. It was late when I got supper and I was very tired indeed. weather cloudy. Tuesday May 19th 1896 Will and I went to town early this morning. He took Marys kettle home and I stopped at home a little while. We got hone in plenty of time to get dinner. The boys planted corn in the afternoon. I made a little more garden and looked after chickens hatching Wednesday May 20th 1896 I did a little sewing besides the regular work. They finished planting corn wast of the road at noon. Will disked the sod and Seth harrowed in the afternoon. weather pleasant till eve more rain. Thursday May 21st 1896 I sewed a great part of the day. I made me a little cape. Will finished planting corn. Rob was out for his breakfast. I had more chickens hatching. Friday May 22nd 1896 It was a fine day. Mother and Rob were out. I worked some on my white dress. I put out another coop of chickens. I now have 300. Will and I went down town after supper.